Sometimes the best things in life start off by accident. Back in the spring of 2011, on a well-known writers' website, (Authonomy), I started to read a manuscript that had me in fits of laughter. At that stage it wasn't completed, but it reached the Editor's Desk. The author was also a friend on Facebook, so I asked him if he wanted someone to proofread it as HC had requested the full MS. He generously allowed me to edit for him and I was delighted, because I got to read the whole book and really enjoyed it. As a result of this, and of the kind words of my original 'client', I picked up a few paid editing jobs for aspiring authors and started "Lilian Kendrick Writers' Services". I even got to edit for a couple of publishing houses. That's a great way to read lots of books and get paid for it. All of this was accidental, as I never actually set out to be an editor. I was just doing a favour for a friend because I loved his stories and it really changed my life. A couple of weeks ago, I decided to republish one of my books that had gone out of print when I left my publisher. I'd never self-published a paperback before and it was a steep learning curve. I made a few mistakes with the formatting, but they'll be corrected soon. So I decided to publish my poetry too. No mistakes this time! It seems I've got the bug for publishing now, as I've just helped a friend to republish a couple of his books too. Links will follow as soon as they are live. Seems I'm now not only an Accidental Editor, but also an Accidental Publisher. Whatever next? P.S. 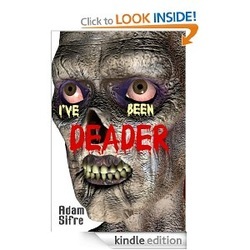 Just so you know - the author who got me started on the editing circuit was Adam Sifre, and the book was I've Been Deader (Click title to view on Amazon). Once upon a time, a teenage girl had BIG dreams. Well, they seemed big at the time, anyway. She wrote them down and forgot all about them. That was where it all began. That was all I had to go on when I started to write the book I called "Unspoken". I'm not one of those clever writers who can plan in advance. I sit down at the computer and start to write, without having a clue where the story's going. The characters and events pop into my head and introduce themselves, politely or otherwise, before making their escape through my fingers and appearing on the screen. I don't think about plots and sub plots, literary devices and story arcs. I just let it all tumble out and land in front of me. When I can write no more, I stop for the day. The next session will start with a little reshuffle. I can't really call it an edit, because I rarely change very much, unless it's wrong and I can't even begin to define how I know if something's wrong; that's up to the Muse. Once we've fixed what's wrong, I let the story carry on telling itself. It's as if I'm an observer; I laugh at the funny parts and I cry at the sad bits. I sympathise with the heroine and fall in love with the hero. I do what I can to facilitate their happy ending. That's how it was with "Unspoken". I thought I was writing a story about a 'bucket list', but the Muse had other ideas; we were writing a love story. We were writing about Lydia's coming-of-age, albeit middle-age. If my MC had been 20 years younger, this would have been 'chick-lit', but as she is 44 at the start of the story, it has to be 'hen-lit'. To cut a long story short, I posted some of the chapters on a writers' website (authonomy.com) where it won an editorial review by being one of the top five books in August 2013. While I was waiting for the review, which took seven months, I submitted the MS to two agents who rejected it, and to Carina UK, (Harlequin's digital inprint). Carina UK said lots of lovely things, which I won't repeat here, and offered me a contract for publication. That's when the work really started. There were a few suggestions for tweaks and addition to the story, and I found it to be a steep learning curve working with experienced and knowledgeable people. It's like living the dream, in a way, when you hold a real contract in your hands! The rewriting is now done; the manuscript is being prepared for publication as an e-book, and emails are whizzing back and forth about cover design and all sorts of wonderful things. The book has a new title too. 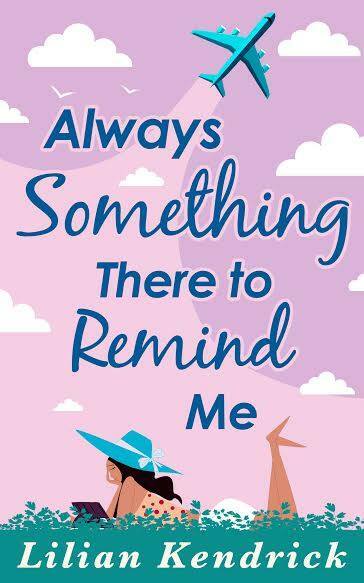 It will be released just after Christmas as "Always Something There to Remind Me". Someone, not a million miles from here, still can't really believe it. The Cost of Editing - Blowing the Whistle. So, editing's easy, is it? Then why don't you get it right the first time and do away with the big, bad editors who have the gall to expect payment for the work they do? Yes - I'm angry - In fact, I'm furious. Some people seem to think that all you need is a good story and it doesn't matter if you can't string a coherent sentence together with appropriate spelling, punctuation and grammar because the editor will fix that. It's time to wake up and smell the coffee; story may be king, but if your readers stumble over every sentence you write, they won't bother to read much of your work. Then there are those who think anyone who has ever read a book can edit one - wrong again. You can't find all the answers by running it through the spelling and grammar checker on your computer. Sometimes, they get it wrong - spectacularly so. In order to edit, you have to have a sound knowledge of grammar and structure and the common sense to know when it's correct to allow idioms. You also need a range of international dictionaries and an understanding of dialect and slang across a number of cultures. Who am I to be saying all this? Let me present my credentials. I hold a teaching degree in English and Modern Foreign Languages (French and German) and have in excess of 30 years' experience in education. I am a grammarian by trade as well as an author, poet and editor. However, I'm not here to throw a rule book at anyone. I'm the first to admit that sometimes the rule book should be thrown out of the window. I also believe that the best editing is a process of negotiation between author and editor and this should happen before the work is even seen by a publisher. That brings me to my next point. Would you expect the plumber to come out and fix your toilet without charging a call-out fee? Editing takes time and in today's world, time is money. Writing is an art form and editing is a craft. If I undertake to edit a book at any stage, that is a professional commitment on my part and whilst I am doing that I am not earning my living any other way. So if I'm editing a book for a week, that's a week when I'm not teaching and therefore editing is my only source of income. My bills still have to be paid, I still have to eat. I cannot afford to be a charity. Recently, I spent a substantial amount of time editing two extremely difficult pieces of work and the publisher who had engaged me reneged on our payment terms, claiming that the work was unsatisfactory but failing to provide evidence in an accessible format. By the time I added up the working days I'd lost and the failure to pay the agreed fee - or even part of it - I was left in dire straits financially. The client then informed me that in future they would only pay 25% of the going rate for my services, and that, only if they approved the work after it had been done. This, after spending six months telling me I was the best thing since sliced bread! (I have the emails to prove it.) Needless to say, we have parted company. I could see where this was going. I would do the work; they would not approve it so I would not be paid. Or, if they did approve it, I would be paid the equivalent of $10 a day or less. They told me I would be easy to replace. Fair enough, but my heart goes out to my successor with this message. I hope your altruism pays off because sooner or later your work won't. Sometimes an idea just gets hold of you and you have to write the story. That's what happened with this one. I started it last Summer and now it's complete - well, 'all bar the shouting,' as they say. Just the final edits to do and it's off to meet the world. For the time being you can read it HERE (Click to Open) but it won't be there for long. As soon as the editing's done it's off to the publisher who is waiting in the wings. Oh, by the way - if you are a member of Authonomy.com, could you lend a little support as Unspoken is currently ranked at #15, and it would be great to get it into the top five before I have to take it down. I suppose I was thinking about ‘bucket lists’ and how we all have crazy plans as teenagers and then forget them when we grow up. It’s pure unadulterated romance for the older generation – Hen Lit. I’d like Lydia to be played by Victoria Wood and Des by Colin Farrell. At fifteen, the whole world lies ahead of you...at forty-four, has it passed you by? I hope I’ll be able to get representation for this one, although I do have a publisher interested in seeing it when it's completed. It’s not finished yet – but it will have taken six months. I suppose the style is a little like “Bridget Jones’ Diary”. I was discussing life, the universe and everything with another writer online and suddenly inspiration struck me. My beta readers tell me it’s a fun read, and the love scenes (or naughty bits as I call them) are proving popular. http://authonomy.com/books/45954/unspoken/ I'd love to hear your feedback. At the moment I am eagerly awaiting the birth of my second grandchild. I can't sit still, or concentrate on anything at all as my daughter is two days past her due date and we think (hope, pray!) that she has just gone into labour, so the arrival of the little fella seems to be imminent. I've had the pleasure of spending the afternoon with my three year old granddaughter who is about to embark on the great adventure of being a 'big sister' and is almost as excited as I am about the impending arrival. It causes me to ask myself "Is it possible to feel more love than this?" The answer, of course, is that our capacity to love should increase in proportion to the number of people with whom we share it. I raved about it all over the Internet, I reviewed it, I helped edit it and I promoted and plugged it at every possible opportunity. It all paid off in the end because Adam Sifre has now agreed to release the hostages, take the shotgun away from my head and not to sell scandalous stories about me to the Sunday Tabloids. Yes, dear readers, "I've Been Deader" by Adam Sifre is now a published work of Comic Horror, and I can once again walk down the street without being seized by one of Mr. Sifre's henchmen saying "Have you tweeted about it today?" or, "I didn't see anything about zombies in your FB status this morning." You can get it now for your Kindle, and I believe the paperback will follow soon, published by Taylor Street Publishing. I can highly recommend it - you'll die laughing! PS - I did it, Adam. Can you send my cats back now, please? I don't often talk publicly about my beliefs. I've never written about it from a personal point of view before,except in fiction; but sometimes you have to 'stand up and be counted'. So count me! I was born and brought up as a Catholic and I still practise. Maybe one day, with enough practice, I'll get to be perfect. I'm also probably a heretic because I don't believe that this is the one true religion. It's just that for me it has most bases covered, and the ones that aren't, I cover in other ways. How does that work? Let me take a trip back in time to my schooldays. I was convent educated, but when I was fifteen, one of my school friends became a born-again Christian and started attending an evangelical church. We weren't particularly close, but she talked to me about it and I was fascinated by her enthusiasm. She gave me a couple of books to read which had a profound effect on my thinking. One was called "God is for Real, Man" and the other was John's Gospel in Modern English. That was when I realised that sectarianism isn't really for me. I started to think about Christianity in a new light. I didn't 'convert', I just woke up and opened my mind and heart to the real meaning of Faith, which is all about the love of God and my fellow human beings, and not so much about the way in which you choose to worship, or even the name by which you call your God. I suppose my Faith is a sort of "Pick 'n' Mix" really. In my late teens I had a friend who belonged to an Elim Pentecostal Church. 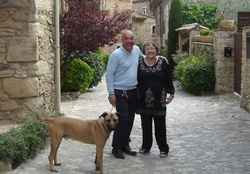 She often slept over at my house on Saturday nights if we'd been out socialising - then on Sunday morning she'd come to Mass with me and we'd go to her house for lunch. In the evening we'd go to her church. It rocked! Variety is the spice of life indeed, and I was full of admiration for the way people spoke so openly about their beliefs and shared their testimony with the rest of the congregation. I never had the courage to do that, and it's only in recent years that I have begun to apply the Christian label to myself and to state that it's all about the love of Jesus Christ without whom I am nothing. I read the bible much more too. It's full of Good News, you know. There, I guess I've just delivered my testimony. It was incredibly difficult, but I feel better for it. Oh yes, I'm still attending my own church and will no doubt continue to do so, but I hope I'm bringing something extra to the table and maybe, one day, I'll have the opportunity to share it.